Perlecan antibody LS-C15763 is an unconjugated mouse monoclonal antibody to human Perlecan (HSPG2). Validated for ELISA, IHC and WB. Recognizes domain III of human perlecan. Domain III shares homology with the short arm of laminin A and B chains. Suitable for use in ELISA, Western Blot and Immunohistochemistry. Western Blot: 1-2 ug/ml. 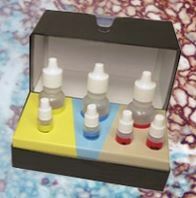 Immunohistochemistry (Frozen or FFPE): 5-10 ug/ml. Note: Formalin-fixed, paraffin sections require pretreatment with 0.1% protease for 30 minutes at RT prior to the blocking step. Positive control: Human breast, colon, liver, lymph nodes, pancreas and prostate tissues.